On May 14, 2016, the Apollo 8 astronauts will reunite for ‘An Evening with Apollo 8’ at the Heritage Flight Museum, located at Skagit Regional Airport in Burlington, WA. This once in a lifetime opportunity is a fundraising event to support HFM and will be available for a worldwide audience to watch live on Ustream for $19.95, as well as on demand at a later date. NASA’s Apollo program ignited a fire of passion, innovation and ingenuity that propelled the United States into space and culminated in the US being first to step foot on the moon in 1969. NASA’s Apollo program ignited a fire of passion, innovation and ingenuity that propelled the United States into space and culminated in the US being first to step foot on the moon in 1969. Before the lunar landing though, came all the other “firsts”… first to fly the Saturn V, first to leave Earth orbit, first to orbit another celestial body, those firsts were achieved in 1968 by Apollo 8 crewmen Frank Borman, Jim Lovell and Bill Anders. 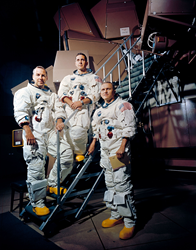 Imagine hearing the story of the Apollo 8 mission from the men who flew it. On May 14, 2016, the Apollo 8 astronauts will reunite for ‘An Evening with Apollo 8’ at the Heritage Flight Museum, located at Skagit Regional Airport in Burlington, WA. This once in a lifetime opportunity is a fundraising event to support HFM’s mission to honor veterans and keep history alive. Moderator David Hartman will lead astronauts Frank Borman, Jim Lovell and Bill Anders in a candid and informal discussion about the first manned mission to the Moon. The event will be available for a world-wide audience to watch live on Ustream for $19.95, as well as on demand at a later date. To learn more about how to sign up for the live stream, visit HFM’s website at http://www.heritageflight.org. The Heritage Flight Museum, founded 1996 by Bill and Valerie Anders, is a non-profit 501(c)(3) organization dedicated to the preservation and flying of historic military aircraft. Visitors can get an up-close look at the selection of flying World War II, Korean and Vietnam era aircraft. For more information about the Heritage Flight Museum, visit their web site at http://www.heritageflight.org. HFM is also on Facebook (http://www.facebook.com/heritageflightmuseum) and Twitter (http://www.twitter.com/heritagefltmus).